This gorgeous gift set is a great way to sample Made with Love's Edible Rainbow. 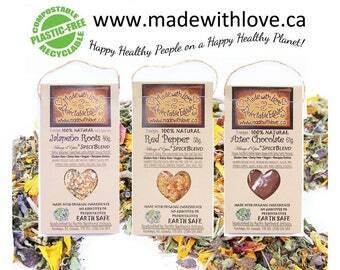 Four Gourmet Spice Blends, 100% natural, handcrafted blends of veggies, herbs & spice in gorgeously green, 7x4" heart punched plastic-free compostable cellophane sampler packs. 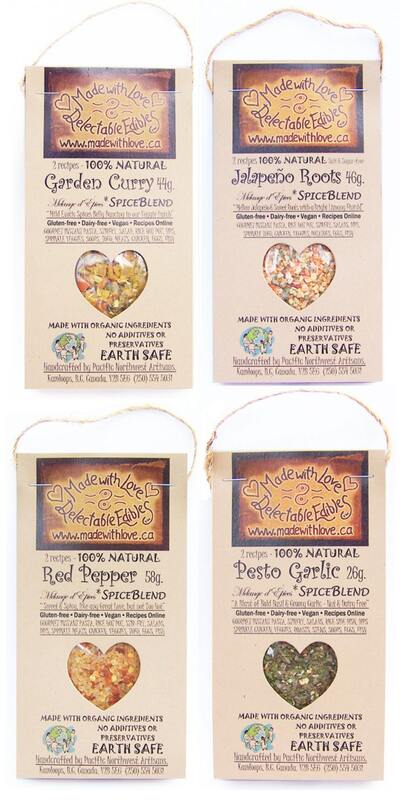 Your assortment comes nestled in our signature eco gift package with kraft tissue, dried flowers, hearts, herbs and spices. 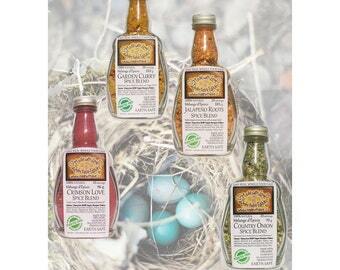 A gift for the heart and a real blessing from our earth, this collection will tantalize tastebuds and leave you and your loved ones begging for more. Traditional blends with a twist of fusion fare & earth trekking adventure... A gift for the spirit and a real blessing of the Earth. 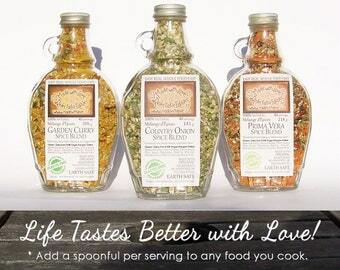 Make magic gourmet "10 minute" pasta bowl dinners with rich gorgeous real cream sauce or decadently divine clear sauce. Vegan, Gluten-free, Dairy-free, Vegetarian and Meat recipe options all included. We welcome payment directly with Visa or MC by phone to 250 554 5031. Thank-you for your conscious spending! Together we are changing our world. Everything looks great . and will make a wonderful gift.